My girlfriend showed me how to use my utensils, but I’m not sure she is correct. I have a job interview at a fancy restaurant coming up. Help. My colleague never puts his knife down when eating. Is that correct? I read that there is a “finished position” for utensils. What is that? I have received a number of questions recently about correct behavior during a business meal, especially concerning the use of utensils. 1. Waving William: You wave your hands around with your utensils in them when you are talking at the table. 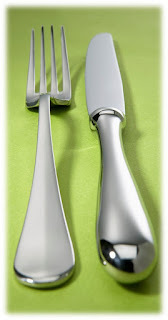 Beware – the food on the utensils may go flying toward your neighbor! It’s best not to do much gesturing at all while you are dining, and never with a utensil in hand. 2. Finger-Pusher Fran: You want to eat every last bite, so you use your finger to help push food onto your fork. The days of the “clean plate club” are over. If you can’t get the food onto your fork without using your finger, leave it on the plate. Or, eat Continental style. In this style, the knife is used to push food onto the back of the fork. 3. Pitchfork Pete: You make a fist around your fork when cutting your meat. You look like you are holding a pitchfork! You should hold a fork with the handle inside the palm of your hand, and use your thumb and index finger to manipulate it. 4. Split-Personality Susan: You employ both the American and Continental styles of using utensils during one meal. When eating in the American style, you cut your meat using both knife and fork, then place your knife at the top of the plate and switch the fork to the dominant hand to eat. When eating in the Continental style, you still cut your food with both knife and fork, but then you eat the meal without putting the knife down or switching the fork to the opposite hand. As mentioned above, you use the knife to guide food onto the back of the fork. It’s generally best to use just one style. • Do not use your knife to cut your bread rolls. Break your roll in half, then tear off one piece at a time, and butter each piece as you are ready to eat it. • Place your knife and fork in the rest position (knife on top of plate, fork across middle of plate) to let the waiter know you are resting but not done with your meal. Use the finished position (knife and fork together diagonally across the plate, knife on top) to indicate that you have finished eating. Additional information about business meals and your career can be found in my new book, The Communication Clinic: 99 Proven Cures for the Most Common Business Mistakes (McGraw Hill, December 2016).